As we’ve been going through this campaign, it’s sometimes been a bit of a struggle to keep the momentum going between set pieces, but this last part of the adventure has turned into a non-stop fight for survival for the party. There had been hopes that the aftermath of last week’s battle in the crypt would give them a chance to regroup and rest – but I’m an evil GM sometimes, and it made no logical sense for their prey to hide and let them have a chance to take him down. So our intrepid explorers began to make their way back to the staircase, to head back up to the ceremonial chambers. As they debated tactics, the sound of leathery wings could be heard echoing through the dark – and then suddenly the chamber was full of bats. 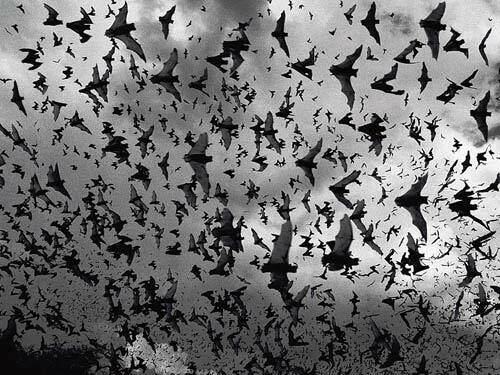 Summoned by Lucan, three bat swarms flooded the rooms and began swirling around. This was not the first time that the adventurers had been bedevilled by bats – their first adventure beneath the streets of Sharn had ended with furry flaming death – and the confusing nature of the swarm attacks had everyone panicked. Blumperkart began making whirlwind attacks to slice through the swarm around him, while Kurtis tried to stab a way through to free Theodore the Bard from his swarm. Unfortunately, while Kurtis’ aim was true, and he skewered a number of bats with a single thrust, he then effectively stapled them to Theodore, nearly killing him. At the same time, Lucan appeared from the shadows and struck at Keil, draining him of energy and severely hurting him. Keil responded by calling a lightning bolt straight down on them both, trusting to his quick reflexes to escape. Lucan resisted most of the force of the bolt but fled back into a hidden air vent to escape. Keil sent more bolts down the air vent after him, not knowing how effective they might be, but hoping to keep the vampire at bay. The battle raged on, with fire proving a useful tool against the bats, but it was taking too long. Aware that Lucan would be back, Koff picked up the unconscious bard and bull-charged through the swarms to make for the stairs. He was followed by half the party, while Ruin, Quilynn and Blumperkart finished off the last swarm. This was, unfortunately, where things took a darker turn. Lucan had looped round in the air vents and come out on the landing above them, reforming from a gaseous state just as Koff barrelled up the stairs. 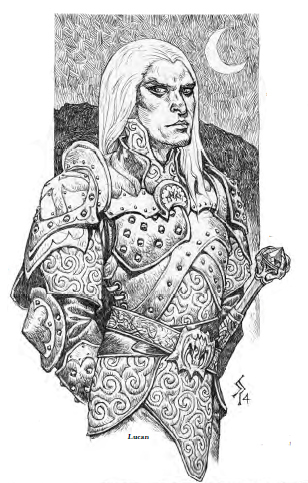 With his piercing gaze, Lucan dominated Koff, and told him to kill the rest of the party. This man, a minion of darkness with pointy teeth? Well I guess that’s a Spoiler! Completely overwhelmed by the vampire’s superior will, Koff berserked, dropped Theodore and ran his sword through the druid Keill. Keill played dead, severely wounded, and was able to fake out both Koff and Lucan so that both of them left him untouched. Koff charged back down the stairs, chasing Kurtis, who outdistanced him and dived for cover behind an altar in the chamber below. Blumperkart gritted his teeth, set his tower shield and braced himself for total defence at the foot of the stairs. Kurtis distracted Koff momentarily by shifting to look like Lucan – enough to command him to be still while Blumperkart tripped, grappled and tied Koff up, but while all eyes were on the fighters, Lucan crept back through the air vent and attacked Quilynn, draining her too. She was able to turn him, forcing him to retreat while Theo, who had been revived by Keill, cast a sleep spell to subdue Koff temporarily. Taking advantage of Lucan’s absence, they pulled back in to the semi-drowned crypt and resealed the stone portal, smearing garlic over the stones to repel him. While they tried to heal up and come up with a workable plan to free Koff from Lucan’s control, Koff woke back up, slipped his bonds and broke free of the sarcophagus in which they’d placed him. With a vicious burst of speed he nearly took down Blumperkart before Theodore was able to subdue him again with another sleep spell.